Convenient plastic reel with ratchet for 400 metres of polywire. Detachable drum. Carry handle with knuckle guard to protect hands. Locking ratchet. Long crank arm for better leverage. Wire loop for connecting power to wire/tape. Holds up to 500 metres of polywire or 250 metres of tape . Can be attached to Reel Stand. Fully galvanized frame. 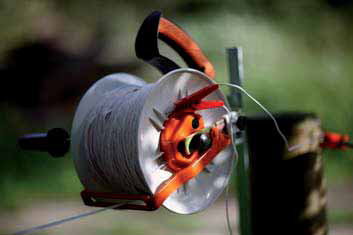 Equipped with an accelerator mechanism so the drum rotates three times faster compared to a standard reel for fast spooling. Carry handle with knuckle guard to protect hands. Locking ratchet. Long crank arm for better leverage. Wire loop for connecting power to wire/tape. Holds up to 500 metres of polywire or 250 metres of tape. Attachable to Reel Stand. How does a mobile fence work? A Gallagher mobile fence is ideal as a temporary and easy movable fence for dividing up large fields for your cattle, sheep or horses. All components for a mobile fence can be assembled simply and easily. Gallagher’s new plastic posts have fixed wire heights so that they are interchangeable. Also, all Gallagher plastic posts feature the unique Twist & Lock system so that conductors can easily be fitted.